NASA's Galaxy Evolution Explorer found a tail behind a galaxy called IC 3418. The star-studded tail can be seen on the left, as detected by the space telescope in ultraviolet light. The tail has escaped detection in visible light, taken by a visible-light telescope on the ground. This tail was created as the galaxy plunged into gas in a family of galaxies known as the Virgo cluster. 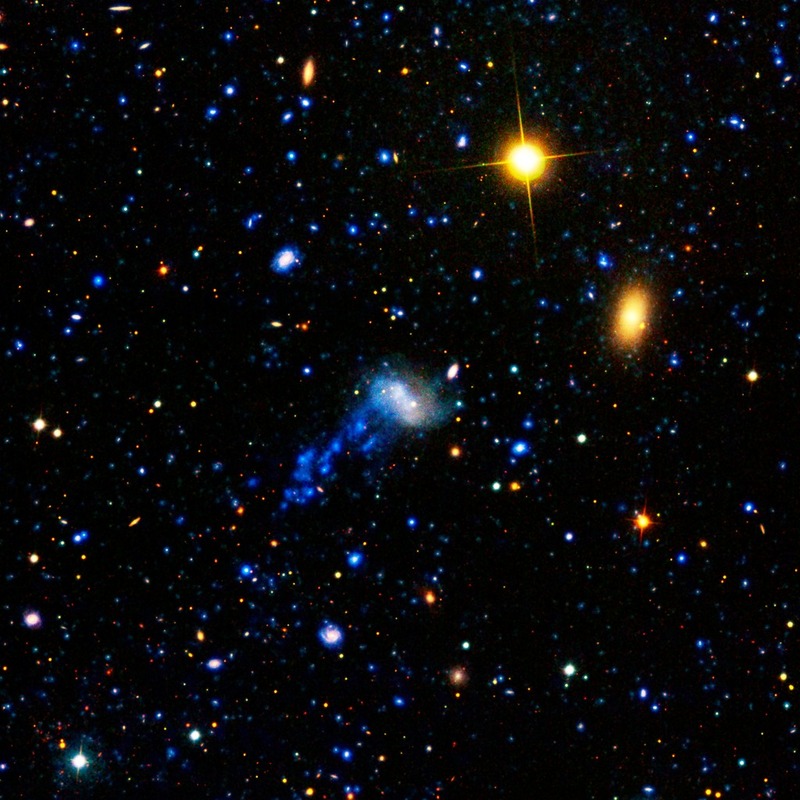 This image is a composite of data from the Galaxy Evolution Explorer (far-ultraviolet light is dark blue and near-ultraviolet light is light blue); and the Sloan Digital Sky Survey (visible light is colored green and red). Other galaxies and stars can be seen scattered throughout the image. Another galaxy called IC 3413, which is part of the Virgo cluster, can be seen to the right of IC 3418 as an oval-shaped blob. The bright large dot at upper right is a star in our Milky Way galaxy.